Throughout the 80s, there were two starters we could rely on. 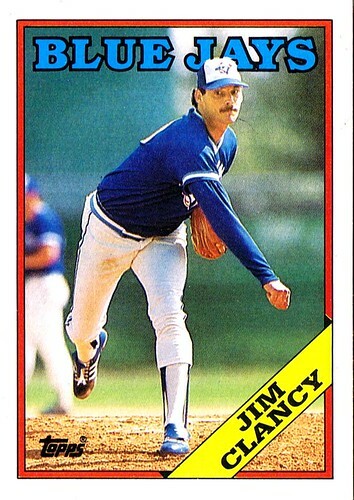 Jimmy Key came around in 1984, but before him there was Dave Stieb and Jim Clancy. Dave Stieb got most of the glory, but Jim Clancy was consistently great. He was a Jay since day one back in 1977 and an all-star in 1982, but today he's known best as the answer to a trivia question. The next time you're with a group of baseball fans, ask them to name the losingest pitcher of the 1980s. Despite his decent ERA and pile of wins, the answer is our very own Jim Clancy. The fact is, you have to be pretty good to hold a record like that. Weaker pitchers won't get the starts necessary to reach 119 losses. I'm thinking about Jim Clancy today because a certain blog reached #54. And he was involved in the first (and I believe only) triple play in Blue Jays history (Apr 22, 1978). Not counting, of course, the should have been triple play in the '92 WS. The Jays had another triple play taken away recently - they ruled Frank Catalanotto trapped the ball. I think this was 2003. I can't get over how cheesy those baseball cards looked. Jim Bo was & is my all time fav jay of all times. Hey, Jim is such a great guy. I can't wait to show this web site to him. He will get a kick out of it. Any questions you want to ask him? Hey Sandy, can you get Jim to leave a comment here? That would be awesome. I'd love to know what he really thought of Dave Stieb. The two were our tandem for most of my youth, with Stieb the #1 and Clancy the #2. How did the two really get along?